Loris Spinelli and Shinya Michimi claimed pole positions for Rounds 9 and 10 of Lamborghini Super Trofeo North America at WeatherTech Raceway Laguna Seca. Spinelli took his No. 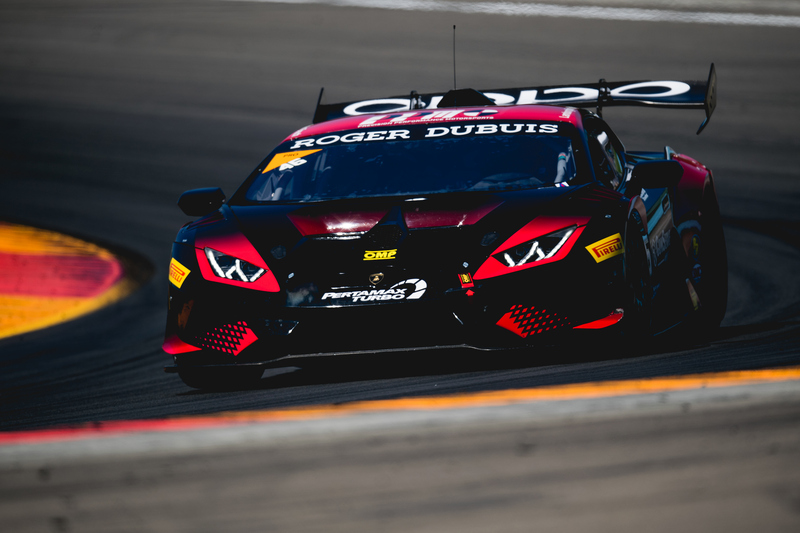 71 P1 Motorsports Lamborghini Huracan Super Trofeo EVO to its seventh pole of the season, thanks to a 1:24.304 lap that will see the Pro-Am class entry start from the top spot overall in Race 1. “It was good to get the pole today,” said Spinelli. “I made a little mistake on my fastest lap but I am happy with the run of the car. Pro class cars claimed positions two through five on the grid for Race 1, led by points leader Edoardo Piscopo in the No. 50 US Racetronics Lamborghini with a 1:24.680 lap. Trent Hindman qualified third overall in the No. 1 Wayne Taylor Racing entry, followed by Brandon Gdovic in fourth. Damon Ockey, meanwhile, scored his fourth class pole of the season in Am in the No. 09 US Racetronics Lamborghini, with Parris Mullins collecting pole honors in LB Cup for the first of two 50-minute races over the weekend. Sunday’s Race 2 will see Michimi start from overall pole, with a 1:25.211 lap time recorded by the PPM driver. It marked the former series champion’s third pole of the season. “The track conditions have been interesting this week,” Michimi said. “We had some new tires and the issues seem to go away with those for a few laps with a good car and I was able to put some good laps together. Other class pole-sitters for Race 2 include Alex Popow (Pro-Am), Ockey (Am) and Sheena Monk (LB Cup). Race 1 gets underway Saturday at 2:35 p.m. EDT/11:35 a.m. PDT, with Race 2 set for Sunday at 2:25 p.m. EDT/ 11:25 a.m. PDT, with both races streamed live on IMSA.tv and squadracorse.lamborghini.com/super-trofeo/north-america.